Issue Six of The Psychedelic Journal of Time Travel has finally been released and within its rather glorious pages is a story of mine called Timepoint. Trystan Mitchell has once again been responsible for its incredible artwork, bringing the characters to life in the space of only a few short pages. Debuting at Thought Bubble, the comic can now be ordered online through Comicsy. Click on the image below to order your own copy! 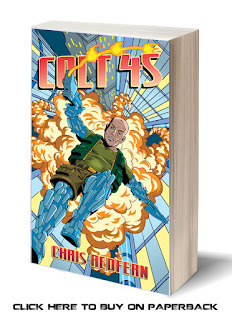 After the successful launch of COLT-45 through Kindle, I've decided the time is right (well, it is approaching Christmas after all) to release the book as a paperback too. Click on the picture below to order your own copy! Here's another sneak peak from artist extraordinaire Edward Whatley's ongoing work on our story 'Atomic Control' for the magnificent 100% Biodegradable. Can you guess where it's set...!? Ken Reynolds, mastermind behind the new comic anthology Slice Quarterly, has recently gone live on its new website. My story, 'All Along The Watchtower', with artist Dave Snell will be published in its first edition. and here for the news release and preview of AATW. The project was unfortunately scrapped due to Adam Cheal (the BSA Editor's) workload. It was briefly reinstated by Markosia themselves earlier this year, but this too went by the wayside. However, now for some good news! Adam has kindly agreed to get the project moving again and he's confirmed that BITP will be included!